I turned 30 yesterday. It was such a special day for me. 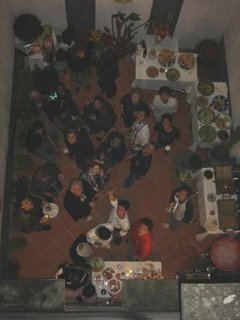 Lots of friends spent their time coming to my house to help me prepare for the party and then even more friends came to join the party in the evening. 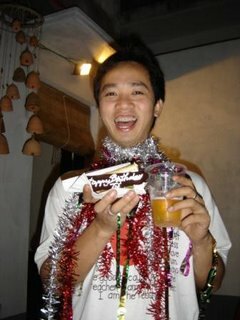 My party started at 6.30 but I don't know when it finished because I drank so much beer but I think it was about 3am! 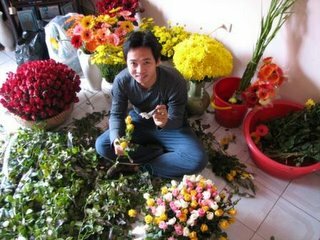 I spent about five hours organizing the flowers from 12am to 2.30 am, then in the morning from 9.00 am to 12.30pm. My friend Mark, helped me to cooked steamed vegetables with his own special dressing recipe, three different curries, two vegetarian including pumpkin curry, potato and eggplant curry and a beef curry. My colleagues from Wild Rice restaurant helped me to prepare lots of fried prawns with chili and lemongrass, ground prawn and cashew nut fried spring rolls, deep fried prawn roll with pork, fresh spring rolls, fresh vegetarian spring rolls, mango salad, mixed salad, stewed beef done in the Hanoi style" Sot Vang", crispy fried squid, mushroom and tofu in clay pot and pan-fried young tofu and bread. After the gifts were opened, my colleagues brought out a surprising birthday cake. With all the lights switched off, everyone sang Happy Birthday and I almost cried with happiness. I still can't believe that I recieved so many gifts and all of them are so special and beautiful. Everyone seemed so nice to me and I hope everyone had a nice evening. Thanks everyone who came or couldn’t come to my party to help me turn a very OLD 30! Thanks also for supporting me at work and in life, in general. Thanks to my family who remembered my birthday, even though they made me crazy calling me so that I had to run up and down the stairs to answer the phone. It was such fun. The weather wasn't good for me to start preparations for my birthday. It was raining and so cold, and the following pictures show you how dam wet and cold it was. The weather wasn't good for me to start preparations for my birthday. It was raining and so cold, and the following pictures show you how dam wet and cold it was. I started my day at a beef noodle shop for breakfast and then we went down to the market right near there. Even though the rain hadn't stop since the night before, the market was still very busy. The normal noisy arguments about the price were happening and a big fight about something almost started. It was a fun time shopping in this small market on a rainy day. The people seemed very friendly here and things weren't expensive compared to other markets. I don't think bargaining works here even though I tried hard. The last thing I bought there was some hot steamed corn for a snack before I left. The corn was so fresh and good. I finished my shopping at about 11.30 by which time I was completely wet and cold. It's ok, I had a fun time wandering around and had bought everything I needed for my party. 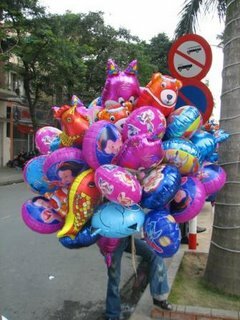 These balloons are so common now in Hanoi. Kids love them because there are heaps of different colours and shapes, they're made from plastic and they can be kept for a long time. 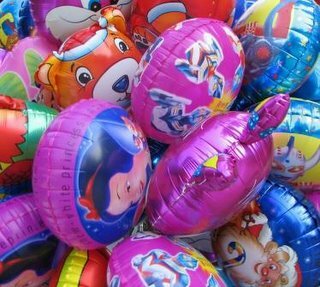 Lots of people exchange balloons as simple gifts instead of other stuff and they also use them to decorate for christmas, weddings and birthday parties. I asked the seller and she offered me one for 20,000VND but the couple before me paid 10,000. As I mentioned in some of my other posts, bargaining is just a game that should not be too serious. "If winter comes, can spring be far behind?" -Percy Bysshe Shelly, Ode to the West Wind. "Last Christmas, I gave you my heart and very next day you gave it away"... Music makes the time go faster and people are more excited about Christmas this year. 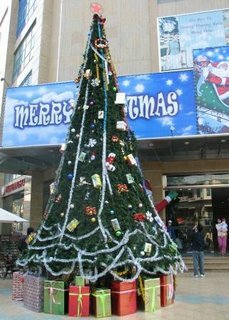 Yes, Christmas is coming, the high shopping season is here. Hanoi is a city in which young people are crazy about fashion. The piercing cold is giving them a chance to dress up. Living standards are improving and prices are up but shops have signs advertising sales or 30% off. 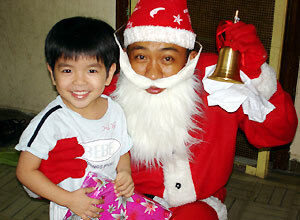 There are lots of restaurant promotions for Christmas day and night. The last two years, we've always chosen Al Fresco's for acceptable food, friendly staff and free flow beer and wine for a good price. 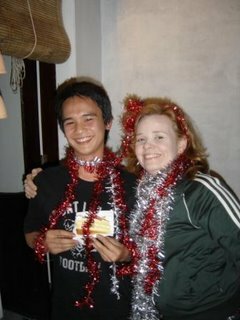 We arrived there at about 11.30am and finished our Christmas day at 8 or 9pm and everyone got drunk and had a great time. We may come back to this restaurant if they have the same deal as usual. 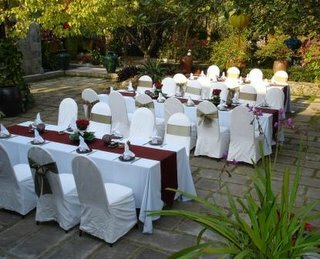 Besides that, there are heaps of options to choose from, including hotels and restaurants but the price is a bit out of our range. 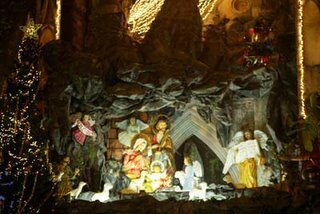 At the beginning of December, there are ads about Christmas everywhere, in front of hotels and shops. I love doing decorating so I went to the old quarter and did some shopping and will put it all up tomorrow. 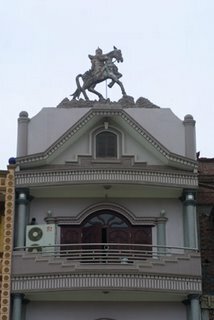 I don't follow any religion but I am happy to go to the church for special events, go to the pagoda for Buddha's birthday and listen to the chanting or prayers. 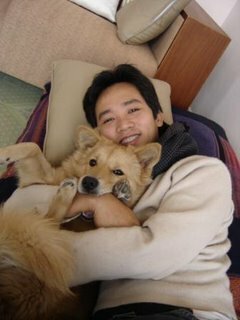 Kate, a writer from Stickyrice got married 3 days ago. Kate and Make have been my good friends for a year and a half. After we had party at Moon River a few months ago, they fell in love with this place and they decided to celebrate their important day here. 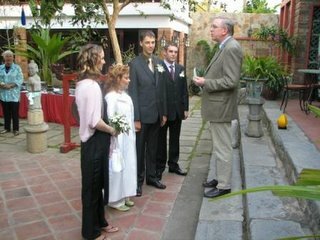 Everyone arrived at 3pm, wandering around the beauty of the gardens waiting for the ceremony. Finally, Kate arrived with her father and she looked gorgeous in a white long dress(Vietnamese ao dai). The celebrant made the speech and they exchanged rings, people started drinking and taking photos. The meal started at 6pm with over 13 choices which suited everyone, including the vegetarians. After the meal, speeches were made by both fathers, the best man, then Mark and Kate. The speeches were funny and everyone laughed at what they said. 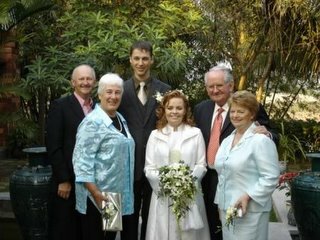 People toasted the happy couple after the speeches and wished them both a bright future, long life and happiness always. Kate and Mark are getting married, a really big surprise for their parents. 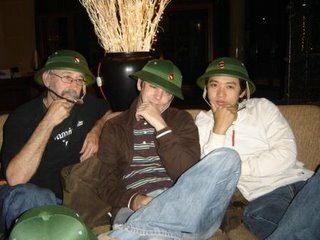 But I am so glad that they decided to celebarte their day here in Viet Nam. 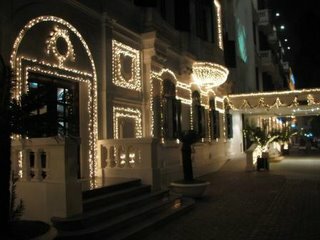 Their parents arrived in Hanoi and we all met up at Au Lac House for dinner. This photo shows the happiness in their parents eyes, because they are going to have a nice handsome tall guy and a gorgeous happy girl in both their families. 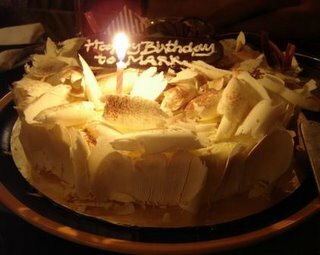 Mark, writer of Stickyrice food website turned 41 the other day. It was a busy and eventful day, a bit weird but fun. We went for the hair cut after a breakfast of beef noodle shop. This was followed by some ten-pin bowling and late morning beer drinking. In the afternoon, we went to the huge Metro supermarket for another Sticky associate whose got married yesterday. We spent almost 3 hours there, wandering around, checking out the prices waiting in checkout lines with a million other people. Sunday is not a good day to go there! 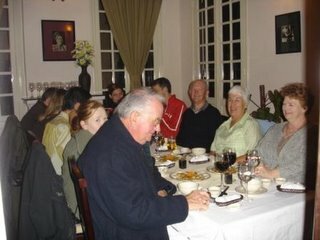 In the evening, we went out again for dinner at Wild Lotus with Kate, Mark and Kate's Father. It was a nice evening and the food was delicious as always. Mark seemed to have a nice day and was happy with his new hair do. I hope he enjoyed his birthday. 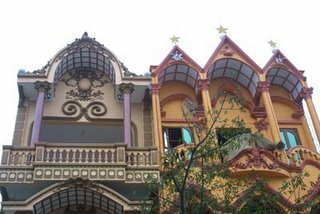 There are lots of crazy ideas in house design in Viet Nam which is not surprising when you think about our history. In the big cities and even in the countryside, there are so many big architecture firms. You may laugh when you look at these pictures. Some of them are so ugly with terrible colours and strange ideas. 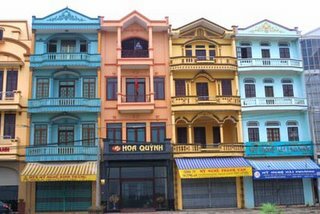 Along with the traditional ochres, I've seen bright pink, purple and green houses here in Hanoi! Is this a King's crown? I talked to a lady seller on the street today. 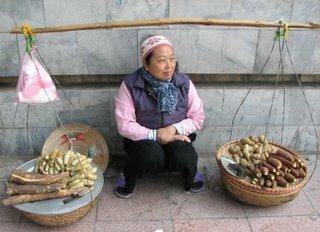 She said to me that she earned 25,000Vnd per day wandering around the old quarter, starting her day at 7am and ending it whenever she finished selling her stuff. 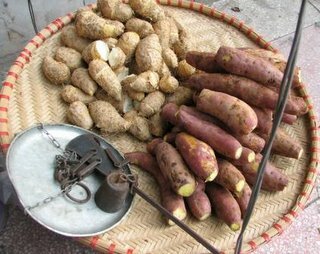 A little sweet, a little bit buttery, her produce was edible yams and sweet potatoes. 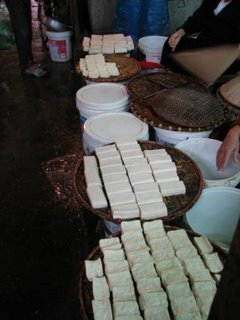 Cakes and sweets can be made from them or they can be enjoyed as a simple snack. They are especially popular in the winter. 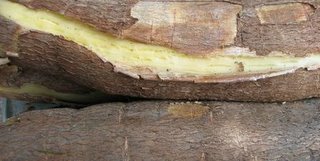 Cassava is another common food for Vietnamese who eat it mixed with rice or dipped in salt, sugar and chilli for their meals. This is not really something to eat everyday, but it's good on occasion. 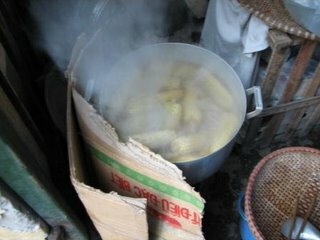 They are filling, can be eaten hot or cold and are sold all day long. It sounds funny when I say that begging is a kind of professional business. Yes, It's happening in Viet Nam. There are even people who hire kids to be beggars to earn money for them. 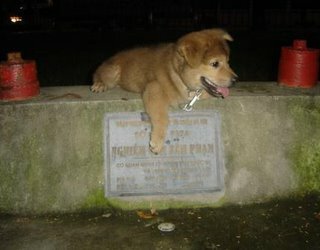 Vietnam's government has been trying hard to stop this practice but it seems hard to beat. Lots of people have been arrested, however. Many kids have been cheated and then kidnapped from the countryside and even in the big cities to be money slaves. Beggars young and old are commonly seen wandering around try to get money, especially in the old quarter. Some young people who are completely healthy but lazy try all kinds of tricks and stories to get money. If they get refused, their attitude changes immediately and they might shout at you or throw something to you. Some pretend they are sick with diseases like AIDS to get sympathy. Besides these pretenders, there are also lots of people with real reasons to beg but the percentage is very low. 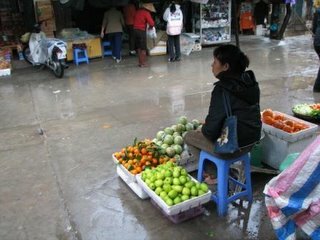 Most poor Vietnamese would rather do some kind of job to earn a living. Hang Tre (Bamboo) street is the only street where the business remains the same as the name. 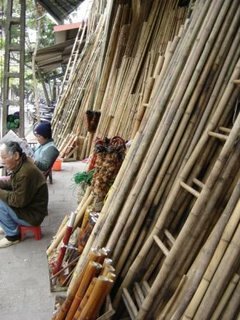 They sell all products made from bamboo such as ladders, sticks and house foundation. Bamboo is such a great tree from Asia which is strong, pliant and it is the only wood which doesn’t rot due to the humidity in such tropical countries like Viet Nam. Hang Gai (Hemp) street, during the French period, sold cords, strings and hammocks. Nowadays, things have changed. 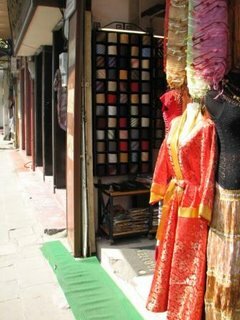 This street sells a variety of goods, including ready-made silk, embroidery, gold and silver products. 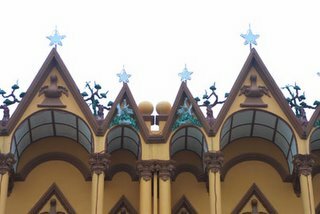 With plenty of art galleries and souvenirs shops, this is one of the most popular spots for tourists and, of course, things are expensive here. 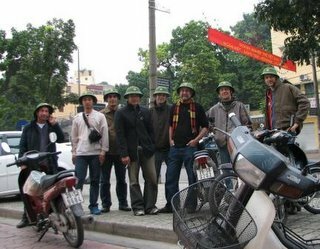 We started the afternoon by meeting up in front of Hanoi towers. 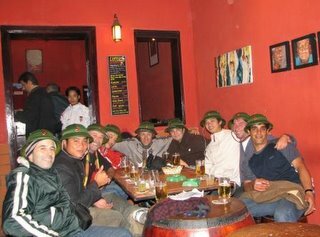 A mixed group including one from Iran, four Aussies, one English, one Kiwi and me - Vietnamese with the Vietnamese soldier's hat on. Everyone on the street looked at us and smiled and thought it was funny. They possibly thought that we were strange or that we were doing some act for charity. 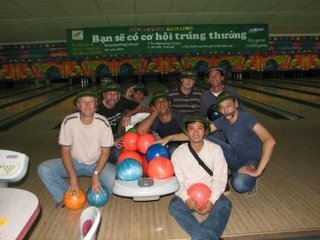 We went to Hanoi Starbowl for a few games and beers, then down to the funny video arcade games. Most of us had never ever been bowling before and I had a sore thumb for a few hours afterwards. After bowling, we went to Highway4 for dinner and drank some plum wine which was strong but satisfying. We ordered heaps of food and everyone seemed to enjoy the meal after a couple of hours of bowling down the balls. 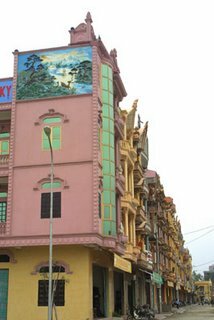 The next place on the itinerary was a very luxurious place, the Hanoi Hilton Opera hotel, where listened to a Spanish guy singing in Spanish of which we couldn't understood a word. He seemed very helpful, using the microphone to call the waitress for us - cheers mate! 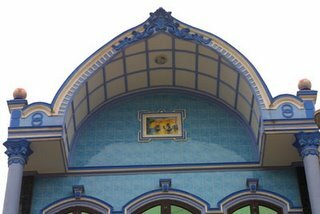 The problem for us was the bill, my goodness me, my eyes almost popped: seven beers, one big bottle of water-and the damage was 490,000Vnd. We consoled ourselves that we deserved it. 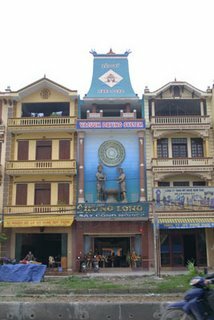 We left the luxury for the Bia Hoi called Lan Chin, had a couple of beers each with crackers, peanuts and the bill was like nothing compared to the other places. The beer is really good here, the staff very friendly.We tried to get into the Relax bar and Seventeen Saloon but we couldn't because of the fire drills going on that night. This was a nuisance because we wanted to make a surprise for Mark for his last free night. Anyway, we kept going to Le Pub for more beer and waited for the girl group (hens party) to join us. Finally, the girls arrived, a bit under the weather but dressed in very nice Ao Dai(traditional long dress). 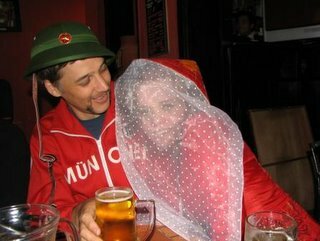 Kate - Mark's wife-to-be looked so gorgeous in Red even after much beer and happiness. I went home at about 12.30 Am because I had to work early the next day, but all of them left there at 6am, probably a bit drunk. I don't know what went on after I left, but surely I know, they all had a good day. 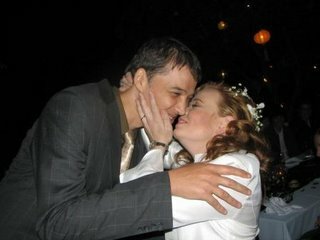 Mark and Kate will be a happy couple forever- Congratulations to you guys from the bottom of my heart. Spread some mayonnaise on a bread roll, add some grilled fish in the bread roll and heat it in the oven. 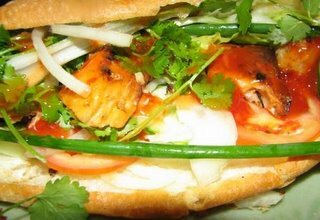 After five minutes, take the bread out of the oven, add some chilli sauce, fresh coriander, lettuce, cucumber and tomato. Wow, so yummy. It takes a few mins to make it at home, and even though eating out is really cheap in Vietnam, there is something satisfying about preparing a meal for yourself. Burning incense is a custom associated with Buddhism in Vietnam. 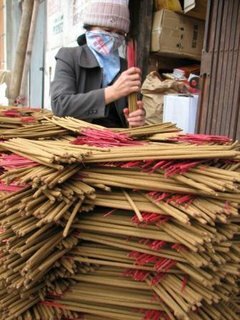 People light incense almost every day at their home altars for their relatives who have passed away, for their business and for the pleasant smell which creates a warm atmosphere. The way the incense sticks are placed into the incense burner on the altar after praying is also important. People say that when the incense finishes burning, the shape of the remains can mean that the god received or rejected your prayer. Making incense is really difficult according to the lady I talked with today, not because of the shape but because of the aroma and the different ingredients needed to get it right. 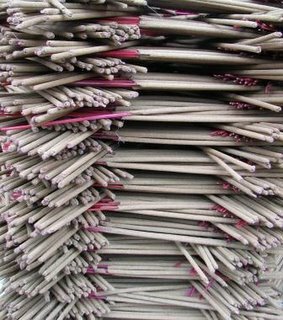 Incense is made from botannical produce, and there are about 20 kinds of aroma. 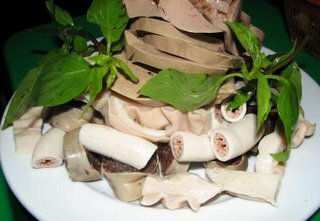 Huong Tram is one of the most popular ones for Asian people and is made from the tree of the same name. There are a few kinds of incense that, when you light them, give off hydrocarbons which can be harmful. I have been invited to write for Global Voices on a weekly basis as a volunteer blogger, which I'm very excited about. I know it won't be as easy as writing my own blog but your encouragement is an enormous support. Anyway, check out my first post over there Southeast Asian Games!. Global Voices is a fantastic perspective on issues and events around the world and how bloggers respond to them. Internal organs porridge no doubt sounds horrible to most people, just the name. But when you eat it, you'll fall in love with it. For Vietnamese like me, it's just so delicious. From the small intestine, kidney, blood, liver, stomach and heart a few quite different delicious dishes can be made. 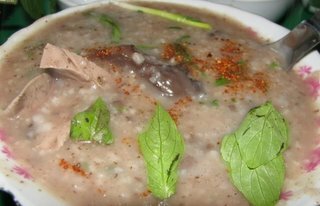 However, there are two common dishes, one which is steamed and the other is stir fried with vegetable pickles and onion. People drink wine and beer with this dish. One plate of offal is enough for four. 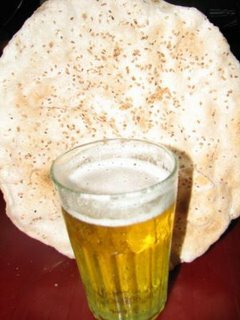 I'm sure most westerners would need quite a few beers or wines before they even tried this dish. What do you think? We bought Misa almost four months ago and can't believehow much he has grown. He's such a cute nice dog. All my friends love him. I usually bring food from Wild Rice for him, which means he's eating five star food most nights. My colleagues at work always kid that he eats better food than most people, and no wonder he is so intelligent and big. 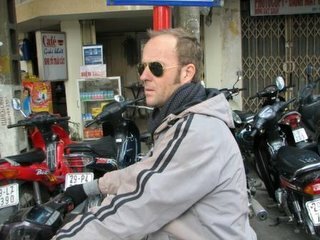 He loves going out by motorbike, standing on the front like he's driving or by taxi. He always tries to sit on the sofa as he thinks he's a human being. Misa also enjoys having showers and playing in the park or walking down the road. He knows when we return home and he's usually looking down from the roof to get our attention. We love Misa even though he pisses in the wrong place sometimes. 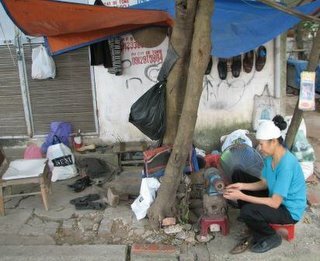 Shoe repairing is such a common street business in Viet Nam. This old lady opens her business from 8am til 4 pm with her very simple shop, a few small chairs, a small machine standing right next to the tree, with shoes hanging as a crazy advertiserment on the wall. It's a classic! She is so friendly and her shop looks busy with heaps of shoes around her in various stages of fixing. It's better to get your old shoes repaired rather than spending a lot of money on a new pair, don't you think?